The Florida Everglades provide a lush and hospitable environment for a variety of plants and animals. While the majority of species found in the Everglades are harmless to humans, there are a few that should be watched out for. Among these are the American alligator, the Burmese python, and the poisonwood tree. While you might not initially expect a tree to be able to hurt you, the more familiar plant species of poison ivy has certainly proved otherwise. And while poisonwoods are much less common than poison ivy, and typically limited to certain locations, they do need to be avoided. 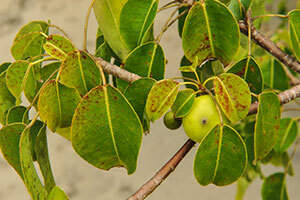 Poisonwoods are prevalent throughout Southern Florida, most notably in the Florida Keys and in Everglades National Park, though their range does extend to The Bahamas and much of the Caribbean islands. Poisonwoods are a flowering tree from the cashew or sumac family, which from a distance, are not especially unique or easily identifiable. Up close, they can be identified by their teardrop-shaped leaves, which tend to droop from their branches and are outlined in yellow. Poisonwoods can grow to heights of more than 60 feet, occasionally producing flowers that are small and yellow. Like with poison ivy, a too-close encounter with a poisonwood can leave you with an extremely unpleasant and itchy rash, though unfortunately, poisonwoods are actually ten times more toxic than poison ivy. The poisonwood’s toxins are in its black sap, which can be found oozing from its peeling bark and should be avoided at all costs, though people can be infected by touching the tree anywhere, not just on its exposed sap. People should always avoid walking under poisonwood trees, especially during or shortly after rainfall, when the sap can fall down onto unsuspecting heads through water run-off. The sap of poisonwoods cannot be washed off with water, and must be treated with oil-dissolving soaps or hand sanitizers. Once a rash forms, it can result in blisters, inflammation, itching, and reddish bumps. If untreated, these rashes can last for days and will quickly spread to other parts of the body past the point of initial contact. Fortunately, rashes detected at the very first signs of discomfort are easily treatable, though more severe cases may require medical attention. Poisonwoods are abundant in the Florida Everglades, and can easily be viewed while skimming across the water on an airboat ride. Since getting up close and personal with poisonwoods is to be strongly avoided, Everglades airboat tours are the perfect way to enjoy these plants from a safe distance away.